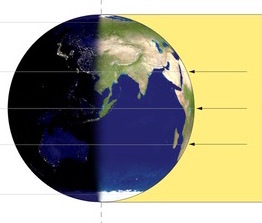 The first insight starts as a fun fact, but over time will grow to become a readily-experienced direct perception: at the spring equinox, while we are “sideways” to the sun, the earth’s axis is lined up with the direction we’re travelling as we circle on toward summer—we’re tilted directly back as we move forward in our orbit. And likewise, at the autumn equinox we’re “leaning forward” as we plunge headlong on our way. You won’t be able to really bring this into a bodily experience right away—but for now, just notice that bigger picture, and maybe play around with living into it, especially around dawn. Why dawn? Take another look at the illustration: every day, as your neighborhood spins its way out of the shadowed night side of the planet and the landscape around you brightens with the first touch of daylight, you’re riding along on the prow of Spaceship Earth looking directly ahead along the planet’s circular path around the sun. The forward motion is always (a-ha! of course…) 90 degrees to the right of the sun in the sky—another fun fact to play with any time of day. So, as the eastern horizon begins to brighten before dawn, the stars in the southern sky mark our “view ahead.” At equinox, this forward motion has the added bonus of being lined up with the Earth’s eternal 23½ degree tilt. As I say, all this will fall more clearly into place over time; for now, you can simply notice where we are in the annual ring-around-the-sun, and watch how that changes our perspective on the sun and stars as the seasons pass. For most of the year one pole or the other leans a bit, or a lot, toward the sun. For a few weeks around the solstices, we can strongly feel the way we’re tipping away from, or toward, that nearby star; in winter, especially, it’s obvious that we’re looking way down across the backward-leaning planet, as the sun sweeps past not far above the southern horizon. Only at the equinoxes is the bulge of Earth’s equator pointing directly toward the Sun, with both poles equidistant from it. This momentary simplification of Earth’s relationship to the sun offers the chance to see—directly, with your own eyes—where you stand on the big ol’ ball of blue we call home. On the equinoxes, the mid-day sun is overhead for those on the equator, and sitting right on the horizon at both poles. 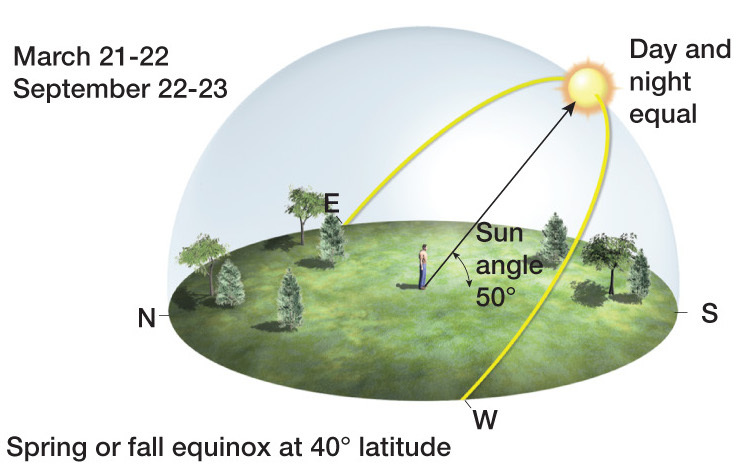 If you step outside on equinox at solar noon (around 1pm Daylight Saving Time), the sun’s height in the sky offers a concrete perception of how far up the curving arc of the earth’s surface you are—the closer you are to the equator, the higher it will be; the closer you are to the pole, the lower it will be. You may think, “Well, that’s always the case; of course the sun is higher at noon the further south you live.” True enough. 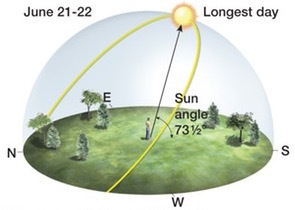 But what’s special about the two equinoxes is that, unlike any other time of the year, our angle of view toward the sun is not tweaked by the Earth’s tilt, so we can feel the earth’s ball as simply as is ever possible, with your angle of view toward the sun depending only—and directly—on how far north you are on the curved surface of the earth. Yeah, there’s some simple geometry behind it [just as at the Equator and the polar extremes, the sun’s elevation above the southern horizon at solar noon is 90 degrees minus the latitude; so the sun is 65 degrees high for those in the Florida Keys at 25 degrees north, and at 50 degrees above the horizon for those in Philly or Denver at 40 degrees north]. But the point here is to simply use your own eyes and body to experience the sun in the sky, so you can feel where you are on the earth sphere. Here in Maine, I happen to be at a pretty convenient spot, close enough to halfway between the pole and equator that the sun is halfway up the sky, about 45 degrees above the horizon. I can add to this perception my memory of living in New Mexico, a few hundred miles closer to the equator, and so can readily imagine—and feel and “see”—that being further down the curve of the earth, the sun is higher there today. Something is shifting: the immediate horizons are no longer the end of my world. The earth beneath my feet curves away, and keeps curving, its body arcing onward far beyond my southern horizon, out to the equator and beyond. I truly do feel the reality that I am standing on a sphere, looking out—and somewhat down, from about halfway up the top side of the ball—at the sun, sitting there beside the bulging center of this immense, spinning home of ours. Now, bring this newly grounded “view from your place on earth” back into to the full seasonal illustration. Once you’ve noticed the sun’s height around equinox, and begun to see and know where we are in that annual cycle of seasons—which is nothing more or less than the changing relationship between the sun and Earth’s consistently-tilted body as it travels around its orbit—these two perspectives will start to come alive when you look out at the sun, week to week and month to month. As we move from spring to summer, the midday sun will be ever higher in the sky; it rises and sets farther toward the north as well. If you stay aware of the direction of the earth’s tilt under your feet, you’ll begin to see the sun’s changing path not as something that “just happens” in the summer sky, but as a direct perception from your location on the tilted planet at that time in its circular journey. Give it some time; before long, a glance at the sun will place you right into a living, three-dimensional earth-around-the-Sun experience that is far grander than the comic-book illustration we were introduced to in fifth grade. For our last trick, let’s take a big step back and see where our “four seasons” picture fits in the larger expanse of the night sky—or, as I like to frame it, how Earth’s current location in the Solar Body is looking out into our Galactic Body. An amazing bit of celestial serendipity now comes into play: by sheer chance, the Solar Body—the full disc of planets circling the sun—is aligned almost perfectly to the center of the Galactic Body’s sprawling territory of stars. One edge of our solar disc—on the side of the sun where Earth is in June—points very close to the galactic center (just 7 degrees off), while the opposite edge of the disc—out beyond Earth’s December location—points almost exactly “out” of our side of the galactic spiral. 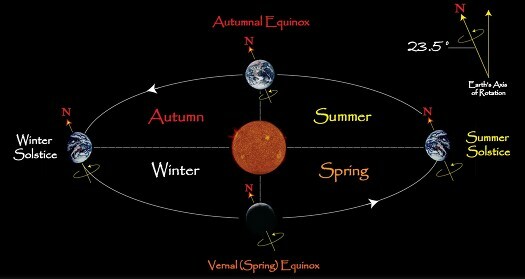 So let’s set a “signpost in space” to highlight that our classic textbook illustration of the seasons also captures four key annual moments in our relationship to the greater galaxy that the Solar Body spins within. At spring equinox here on Earth, we’re barreling along—tilted back, hair a-flying—right toward the galactic center. At the time of the summer solstice, we’ll be sitting pretty on the galactic-center side of the sun (let’s call it “galactic summer”; indeed, as we look directly away from the sun on summer nights we’re treated to marvelous views of the Milky Way, shining bright and huge from its dense core near the southern horizon, on up across the heights of the sky). In autumn, we’ll be dashing away from the galactic center—head leaning forward—and at winter solstice, we’ll be tucked away on the far side of the sun from the heart of the Galactic Body (galactic winter is coming….). While I did consult some key sky maps, all this only came together and became real to me when I went outside to take in the pre-dawn sky with my own eyes. Seeing the brilliant, evocative center of the Milky Way sitting there above curving Scorpio in the southern sky (yup, about 90 degrees from of the first hints of light on the eastern horizon) was the moment of direct bodily perception that—for a moment on a cold March morning—offered a glimpse of Earth’s motion in space and a first touchstone for my still-emerging awareness of our solar disc’s orientation within its galactic surroundings. Each of these glimpses into the solar and galactic scales is, on its own, little more than an abstraction, an overlay of map or mind onto the starry sky. But—and right here in this “but” is where everything changes—as more such moments occur, at different times of year, these outer “maps” begin to fill in and come alive within your own bodily experience. We’re used to seeing maps at each scale—regional road atlases; beautifully rendered state, national, and global maps; images of the solar system showing where each planet is now; even pictures of the galaxy with a “you are here” pointer—but the magic happens in the connections between the scales. Many of us have made the first connection, between our own body and the immediate local landscape; we don’t think about a map when driving around our town or region—we just know the lay of the land. Those who’ve travelled a fair amount develop a similarly lived-in experience of how each place they’ve been fits into the continent, or the world. This is simply the next step of that familiar experience of coming to know our place by watching how the landscape around us shifts as we move through it. The changing views we get of the starry sky are direct, physical experiences rooted in the daily spin of our planet, and its annual journey around our local star. 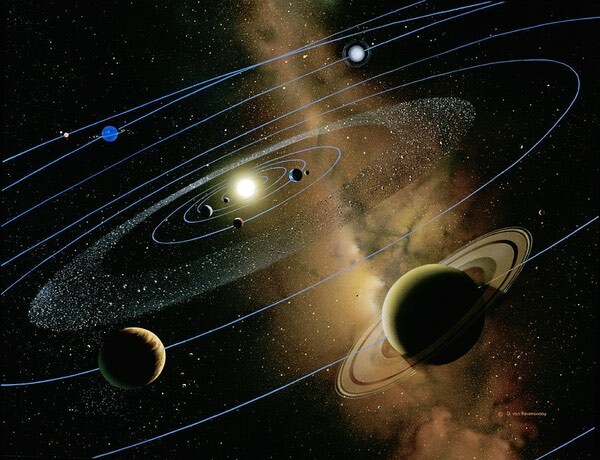 Thanks to the delightfully perfect way that the expansive body of our solar system’s disc spins within the encompassing spirals of the galactic body, that good old textbook illustration of the seasons becomes a bridge that allows our own direct experience of place to root itself within all three of our larger bodies—planetary, solar, and galactic. Again, it’s the connections between these nested scales that bring it alive: your body finding its connection to its immediate landscape, knowing your place on earth in relation to the sun, and seeing your view of the night sky changing as our earth itself circles round its star in our larger galactic home. Just as your place in a local landscape only comes alive after several years of paying attention to what’s around you, so too this larger celestial sense of place will emerge slowly: bit by bit, season by season, year by year. In the very same way that you know what’s around the corner up ahead or over that hill on the horizon, so too can your lived-in experience of the three-dimensional world you’re moving within expand to include these larger scales of home. Trust me when I say that it’s a lot of fun to feel yourself coming alive in this way, here on our ball of rock and fire and water, twirling with its planetary brethren around the life-giving star that binds this solar body together. I should apologize to any southern hemisphere readers for the northern bias of the descriptions herein. You must be used to begrudgingly making all the internal translations and inversions: fall for spring, winter for summer, north for south, west for east. I gotta say, it blows my mind right out of its northern hemisphere skull to even try to imagine the sun’s east-to-west travel each day crossing the sky from right to left—your skies down there sure are bizarre! Posted on 2016/04/10, in Sky. Bookmark the permalink. 1 Comment. Great post Jim. Your explanation of celestial mechanics is well-researched and very accurate.